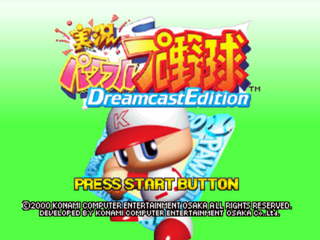 Jikkyou Powerful Pro Yakyuu Dreamcast Edition (実況パワフルプロ野球 Dreamcast Edition) is a baseball game for the Sega Dreamcast released as part of Konami's Jikkyou Powerful Pro Yakyuu series. It was only released in Japan. For whatever reason, the basebal players were made with sprites instead of 3D models (since the Dreamcast is a 128bit console). Main article: Jikkyou Powerful Pro Yakyuu Dreamcast Edition/Magazine articles.